If you wish to, you can now use the internet to book appointments with a GP, request repeat prescriptions for any medications you take regularly and look at your medical record online. You can also still use the telephone or call in to the surgery for any of these services as well. It's your choice. Being able to see your record online might help you to manage your medical conditions. It also means that you can even access your record from anywhere in the world should you require medical treatment on holiday. If you decide not to join or wish to withdraw, this is your choice and practice staff will continue to treat you in the same way as before. This decision will not affect the quality of your care. With online records access you may see something that you find upsetting. This may occur before you have spoken to your doctor or while the surgery is closed and you cannot contact us. If this happens please contact us as soon as possible. The practice may hide parts of your record so that certain details are not displayed online. For example, we may do this with test results that you might find worrying until we have had an opportunity to discuss the information with you. It's up to you whether or not you share your information with others - perhaps family members or carers. It's your choice, but also your responsibility to keep the information safe and secure. Should you share your login credentials, they would be able to book appointments or order repeat prescriptions. They may be able to see your record to help with your healthcare if you wish. Your medical record is designed to be used by clinical professionals to ensure that you receive the best possible care. Some of the information within your medical record may be highly technical, written by specialists and not easily understood. If you require further clarification, please ask your GP when you next speak to them. If you spot something in the record that is not about you or notice any other errors, please log out of the system and contact the practice as soon as possible. If you feel that any information is incorrect or that your record is missing information, we can add amendments to your record, but we cannot delete or alter any historical information. To register for Medical Records access you must complete our Patient Access Registration Form, available in Reception. The request for will go through to one of our GPs to review your record before approving the request. This may take up to 5 working days to process, in the meantime our staff will set you up with access to the other modules if you do not already have a Patient Access Account. Not registered for patient access yet? You can come into the surgery and speak to any member of our reception team who ask to fill out a form where you choose your levels of access. 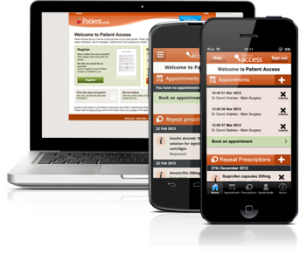 We will then enable Patient Access for you and print off everything that you need to get started. Please bring proof of identity with you. Once you've done this, on the register now page, linked below, click the "Yes" button when prompted if we have provided you with a registration letter and enter your details as instructed in the letter. You can self-register for Patient Access securely online, also from the link below, click the "No" button when prompted if we have provided you with a registration letter, this allows you to gain access to the system and set your password. However, you will only be able to book one appointment before your access is removed. To keep your access, you need to visit the practice with your photo ID to complete your registration. However, this does not include Medical Record Access. For Medical Record Viewer Access, you will need to complete the Patient Access Registration Form and hand that in to reception on your visit. Need help using Online Medical Records? Below is the Patient Access Support Website. You should be able to find the answer to any of your questions on there, if not, then please contact Patient Access Support via the knowledge base.